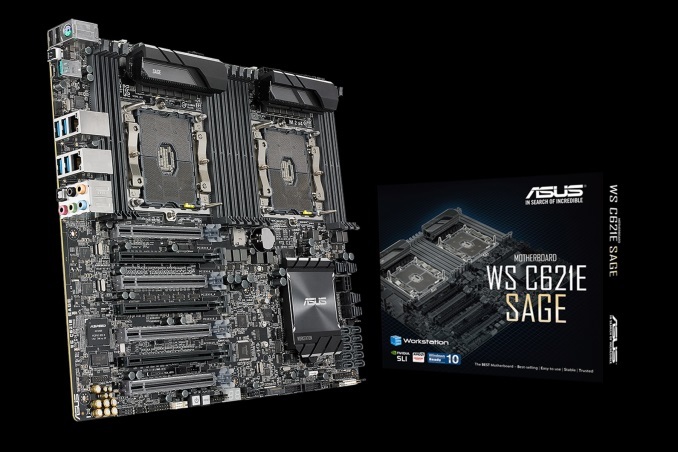 ASUS has quietly announced a new motherboard: the WS C621E SAGE (or just 'Sage' for short). 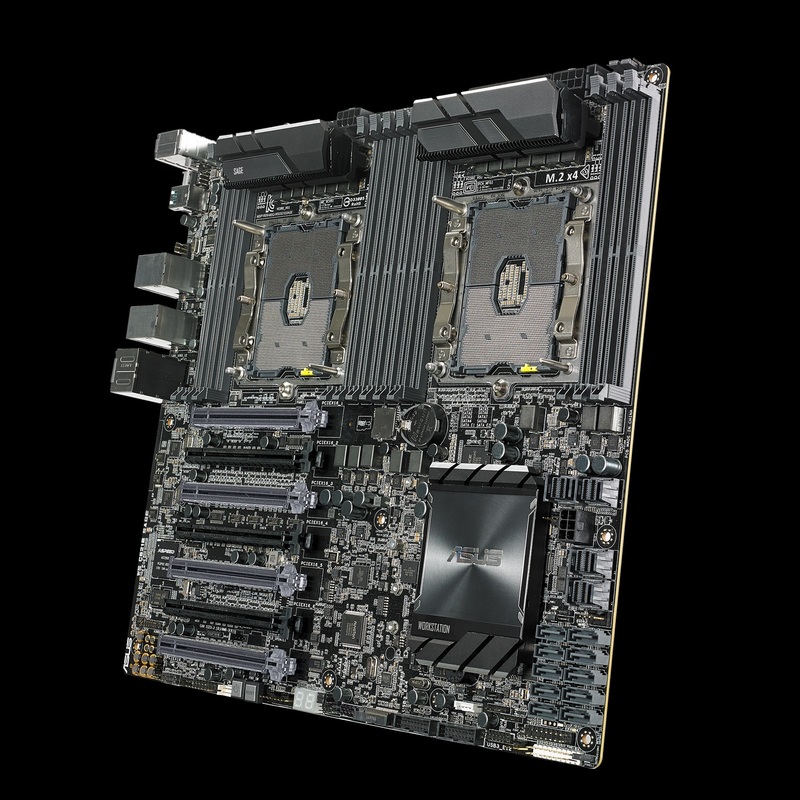 This workstation class board offers users dual Intel LGA-3647 sockets with CPUs up to 205W each, which should support the full lineup of Intel Xeon Scalable processors using Skylake-SP cores. This should mean dual processor support for Bronze CPUs through Platinum CPUs, allowing up to 56 cores (112 threads) in a single system, but also with numerous extras in PCIe and storage. The Sage also supports up to 12 DDR4 RDIMM or LR-DIMM ECC modules with a capacity of 768GB per socket, 1.5TB total, and speeds supported to DDR4-2666. Aside from drooling over such a system, one of the stand-out features listed for the Sage is its ability to overclock both CPUs. We have been told by Intel that none of the Xeons are overclockable, which usually means that the CPU multiplier is not adjustable. ASUS hasn't released any details on the overclocking capabilities, however there are two ICS chips on the board which are usually attached to motherboards that offer significant base clock frequency adjustment, so our current thoughts are it will be using BCLK adjustments for overclocks. BIOS redundancy did not make it on the Sage as there is only a single BIOS chip on the board. 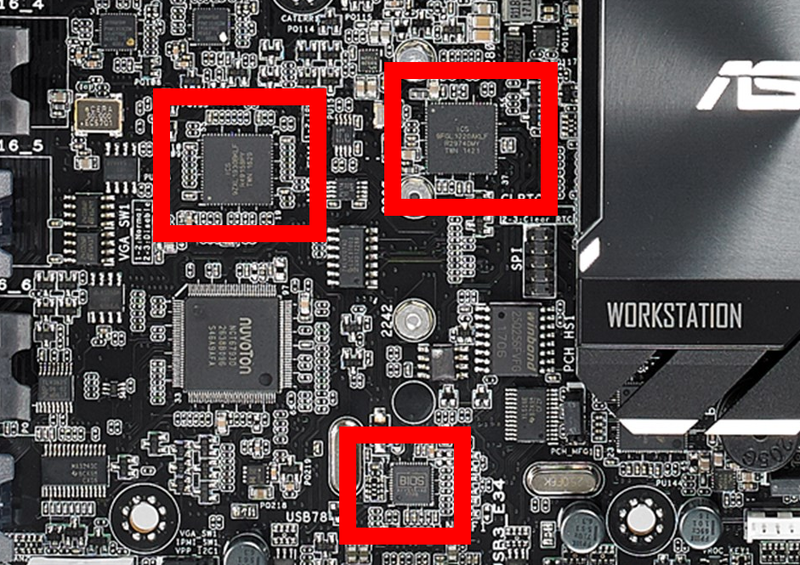 There are seven total PCIe slots with three in x16 mode, two in single x16 or dual x8/x8, and two more at x8 mode (likely x16/x8/x16/x8/x16/x8/x16) from the processors. The dual socket system is able to use PCIe lanes from both CPUs, however only one can have a DMI to a chipset. Partially hidden below the chipset heatsink is an interesting addition to a motherboard - an FPGA. This is a Lattice FPGA chip (LCMXO2-1200UHC-4FTG256C), which apparently offers enhanced I/O features such as drive strength control, slew rate control, PCI compatibility, bus-keeper latches, and pull-up resistor control. Built on the 65nm process, it has 1280 logic elements running at 269 MHz. 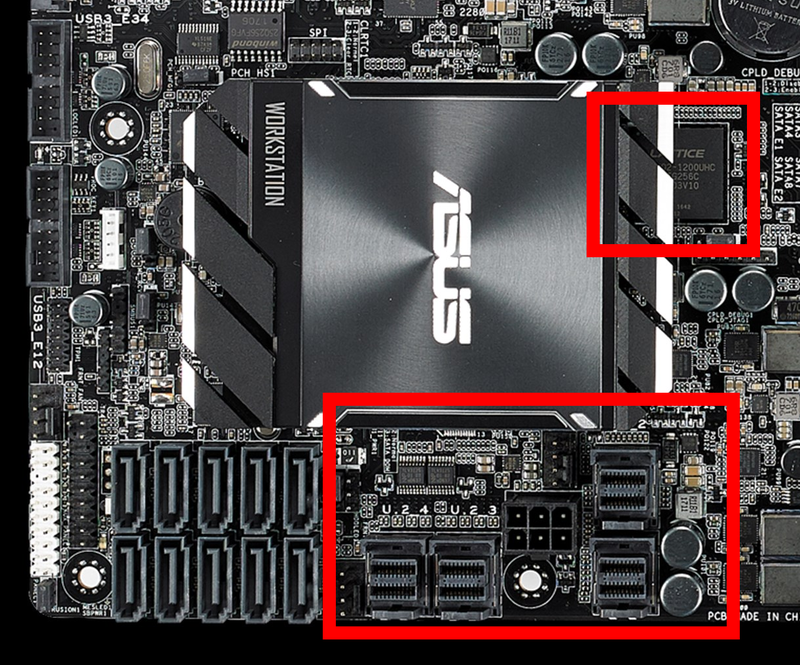 Aside from doing what it says on the tin, we don't exactly know why ASUS is using this chip (over anything else perhaps), although given the lane count on the motherboard we suspect it might be acting as a small PCIe switch as well. We reached out to ASUS for a chipset diagram to confirm our thoughts, and are awaiting a response. Remote management is handled by the ASPEED AST2500, which has a small amount of Micron memory attached. Normally we see this controller partnered with a D-Sub and an ethernet port, although ASUS lists this as 'optional'. There is no pin pad to place either of these, which perhaps suggests that admin access is obtained through the OS or over a managed network connection using on of the network ports. 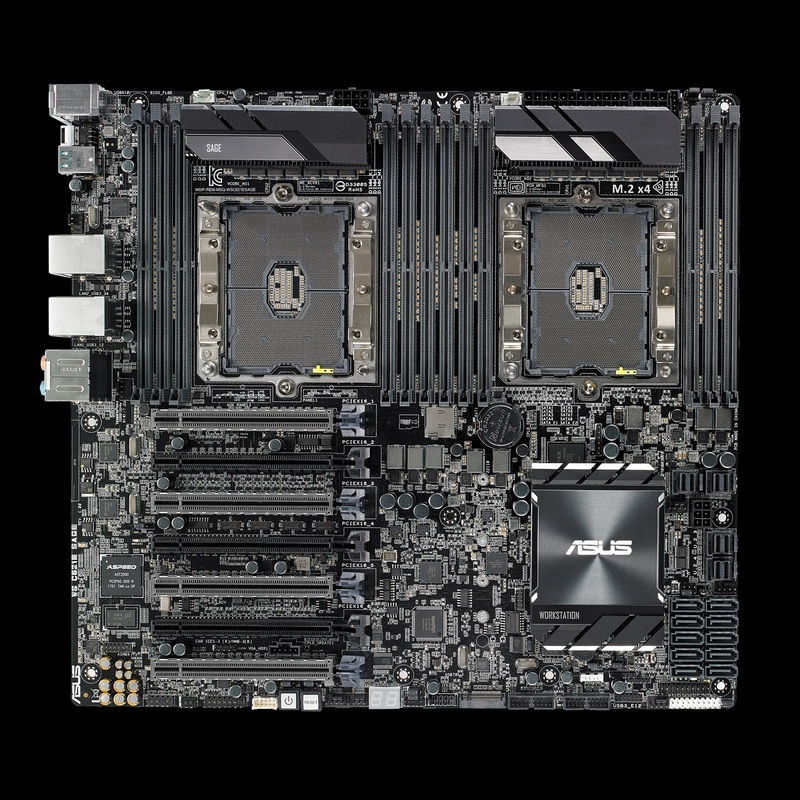 For storage purposes, the board has four U.2 ports capable of RAID 0 and a single M.2 slot able to fit up to a 110mm module and supports both PCIe and SATA modes. All U.2 and M.2 ports are PCIe 3.0 x4. This would mean 20 lanes for storage, and given the PCIe lane breakdown of the PCIe slots and storage, we suspect at least two of the U.2 ports might be fed from the chipset (which the chipset diagram would confirm). The Sage comes with 10 SATA ports, oriented vertically and located below the U.2 ports on the bottom right-hand side of the board. This configuration can potentially be a pain that if you need to remove a locking cable from the bottom, it can require removing all of the cables above it due to the close proximity of the next port(s). Eight of these ports are connected via the chipset and support RAID 0, 1, 5, and 10, while the other two are connected via ASMedia SATA controller. The WS C261E Sage also has a microSD card reader just below the middle DRAM slots and is typically used for base lightweight operating systems. This is likely connected over an eMMC interface to the chipset. USB support is handled by an ASMedia chipset for the USB 3.1 (10 Gbps) ports and the C621 chipset for the remainder. The back panel has Type-A and Type-C USB 3.1 10 Gbps ports, along with four USB 3.0 ports and two USB 2.0 ports. Network capabilities are handled by two Intel I210-AT Gigabit LAN controllers. For audio duties, the Sage comes with an ASUS collaborated Realtek S1220A codec and what looks to be Nichicon premium audio caps. The back panel IO for the audio is a 5 plug stack plus a SPDIF plug. Power delivery for each socket looks to be 7-phase and managed by International Rectifier 3541 Digital Multi-phase buck controllers. The C621 chipset adds some features over the C610 (Wellsburg) chipset of the previous generation, adding Node Manager 4.0 for power and cooling optimization as well as compute resources in an enterprise environment. Native USB 2.0 ports remain unchanged with 14, however, the C620 chipset offers up to 10 USB 3.0 ports. Chipset and CPU communication in the DMI also gets a bump from PCIe 2.0 x4 to PCIe 3.0 x4 doubling bandwidth. NVMe is now natively supported. In the past, platform integrated firmware limits the way builders can customize or differentiate their offerings. On the C620 chipset, the Innovation Engine is enabling system builders to run firmware of their own or choosing for specific use scenarios (server, storage, etc). Pricing or availability has been announced at the time of writing. If prices of previous 2P motherboards are anything to go by, we suspect this motherboard to retail (if it hits retail) north of $700. The processors going into the board could be from a few hundred each to the top-of-the-line Platinum 8180 ($10009), but not the 8180M versions ($13011) as the motherboard does not support 3DS LR-DIMMs. Either way, the board might end up being a small amount of an overall system build. It's a workstation board, where IPMI or somesuch is not a requirement. A server board, I'd agree. "Especially with a price/performance comparison"
There ain't gonna be no surprises there. Single socket epyc is through the roof in terms of value of purchase. Competitive with xeon solutions 3-4 times as expensive. BCLK overclocking for xeons? That's insanely dumb. I just don't see a lot of people spending 15k on a machine just to deliberately compromise its stability and data integrity for some negligible performance increase. No system diagram, but presumably the layout will be as dumb as usual, with an unreasonable amount of I/O being bottleneck by going through the chipset and its pathetically slow connection to the cpu. I think you don't understand whom this board is for. It's clearly aimed at people who just want a lot of cores running fast. Intel's non-Xeon options top out at ~18 cores, currently. So, even people who don't value stability and data integrity have no alternative but to use Xeons. Given that, some subset of those will be interested in overclocking. I think you don't understand what "think" means. Nor highly scalable workloads for that matter. The likelihood of people so stupid having so much money to waste and the desire to waste them on hardware is astronomically low. This is not intel's moronic HEDT segment. People don't buy that to get self esteem. They buy it to put it to work. But there is more to the story. The high end xeon segment has a pathetically low purchase value, and a pathetically bad price/performance ratio. Because the workloads that can scale so high can basically scale on a cluster level. Which means you will get tremendously better performance from more nodes with better price/performance ratio. Which brings us to the point what the target consumers for intel's 28 core xeons are. And this is most certainly NOT aimed at "people". It is aimed at organizations that get to spend taxpayer or investor money, and have deals with intel to put that money in their pocket, getting a portion of it in exchange. This is their sole motivation to buy products with such a low purchase value, they don't make those purchases with their money, they make those purchases with the money of others, in order to get some of that money in their pockets. "It is aimed at organizations that get to spend taxpayer or investor money, and have deals with intel to put that money in their pocket, getting a portion of it in exchange." Suppose you were paying a total outlay of about $150 an hour for someone to do some work for you (salary, benefits, your portion of employment taxes, etc.). This was going to be a long project, lasting years, and that is simply the going rate for their services. Meaning it's going to cost you about $1,200 a day. You also had the option of what tool to buy them. You could buy them a cheap tool for a couple thousand bucks. It's mostly reliable, it can get the job done. Or, you could buy them something better that costs a lot more - say $15k - but it saves an hour of their time per day, and pretty much never breaks down.